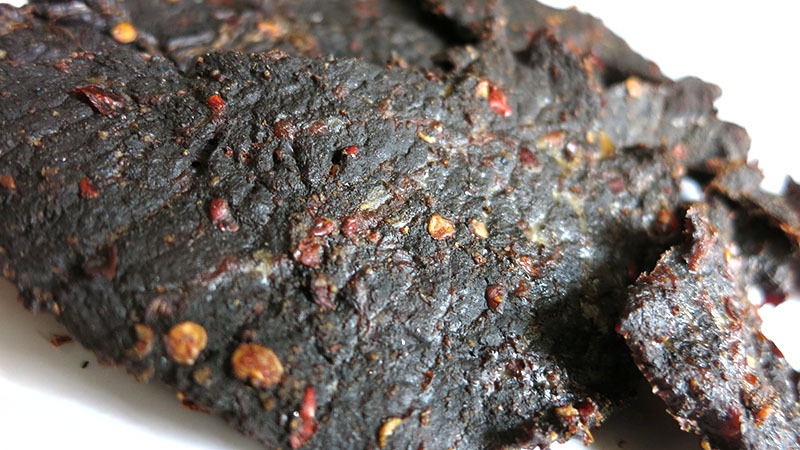 Beef, water, salt, brown sugar, black pepper, crushed red pepper, spices, ground red pepper, beet powder, paprika, dehydrated garlic. The first flavors that hit the palate is a light saltiness with a light chile pepper flavor. With some chewing, the I can pick up an initial light heat, along with an increased saltiness and bits of garlic and other unknown spices. As for being advertised as "Red Pepper", it seems to stand up well. I get a well-noticeable chile pepper flavor and a fair amount of heat. The heat starts out light, but after eating a few pieces, it ramps up nicely. On my personal heat scale, I'd rate this as "medium" (level 3 out of 5). 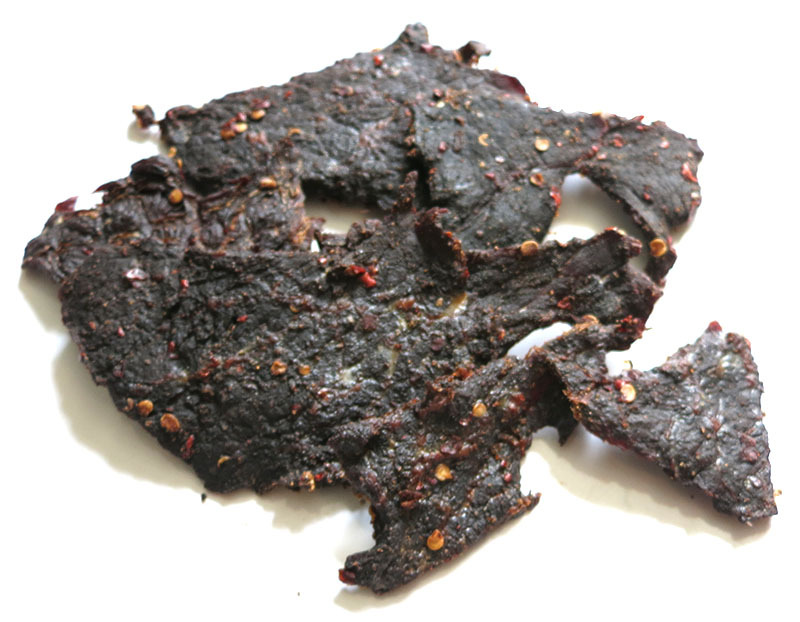 Otherwise, the flavors that largely define this jerky is a combination of saltiness and chile pepper. The saltiness is a little more prominent. There are also lighter levels of black pepper and garlic noticeable. The natural meat flavors seem light. The meat consistency seems much like the company's Original and Peppered. It's lightly marbleized, and I don't encounter much stringiness or unchewable tissues. It starts out chewy, with a fair amount of rubbery character. Once it chews down, it takes on a meaty feel, but never really gets to a steak-like texture. It still retains some rubbery quality while still feel meaty. 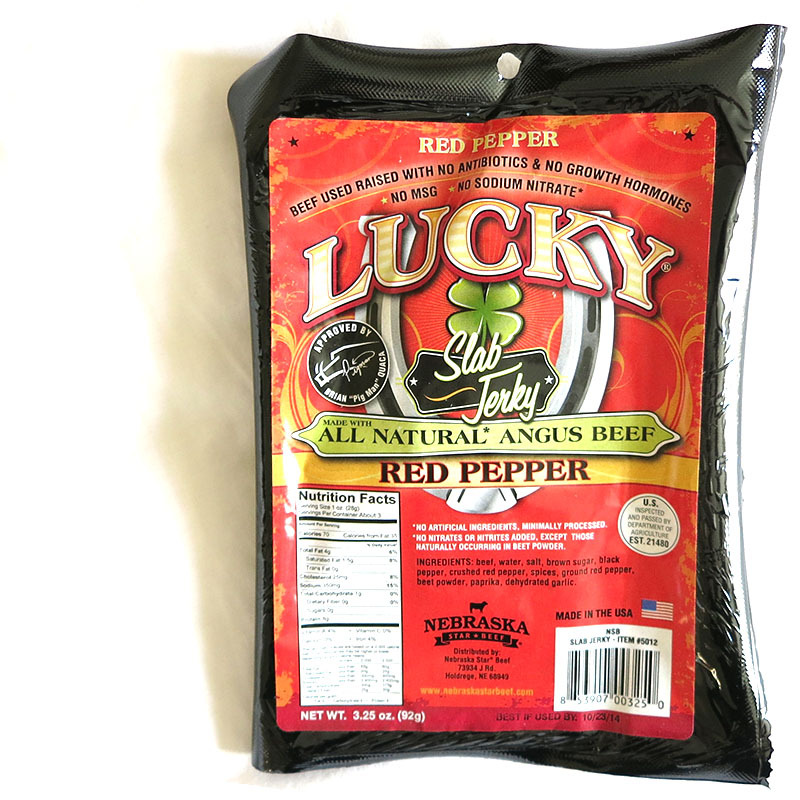 Verdict: This Red Pepper variety of Lucky Brand Jerky has an overall good flavor that mimics the old fashioned jerky style, but with a well-noticeable chile pepper flavor and moderate level of heat. The meat consistency is chewy, but still much like the old fashioned style. I especially liked the lightly marbleized meat, and the meaty chew, although the natural meat flavors are only lightly noticeable.